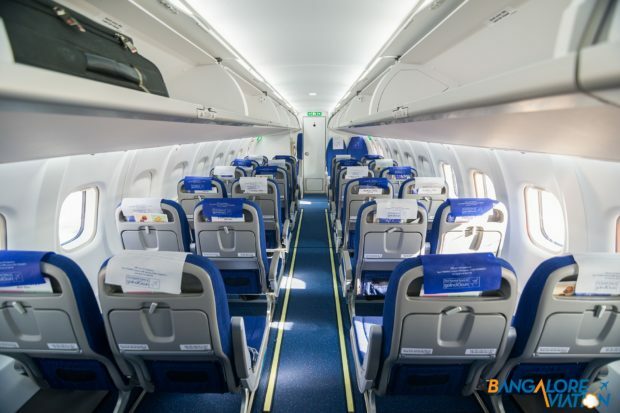 The cabin of Indigo's ATR 72-600. 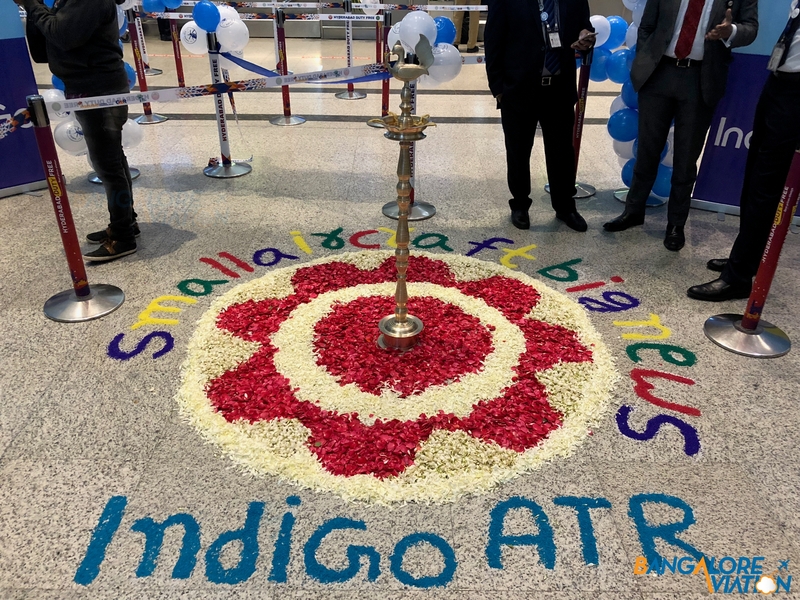 Low cost carrier Indigo has begun operations with it’s ATR 72. The flight was the first revenue flight for the airline on any aircraft type beside it’s mainstay Airbus A320. We were invited by Indigo to travel on this first flight from Hyderabad to Mangalore. 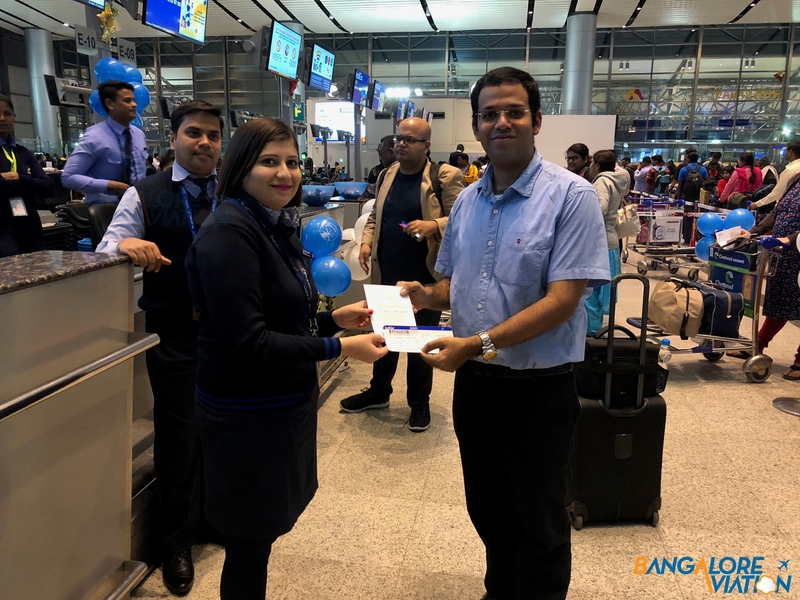 Personally, Indigo is my preferred airline to travel in India, their product and general no nonsense attitude works for me and their range of flight timings makes my one day work trips easier. With the airline beginning it’s operations on the ATR (an aircraft I’m not very fond of), I was eager to see if the same product would carry over to it’s regional operations. I got to the airport about two hours before the scheduled departure time. 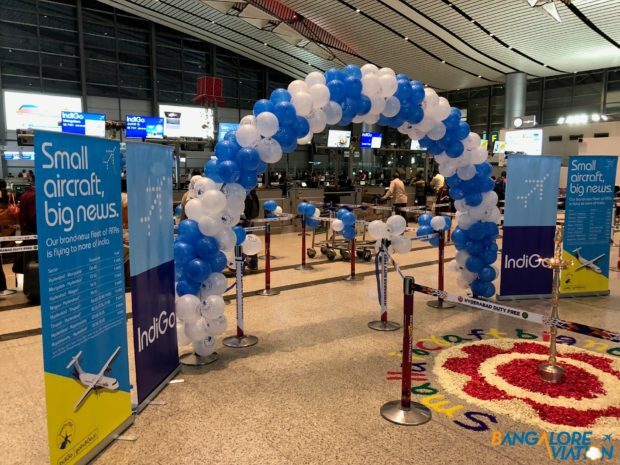 At the end of the line of Indigo counters was a lamp and ballon arch set up for the ATR launch. 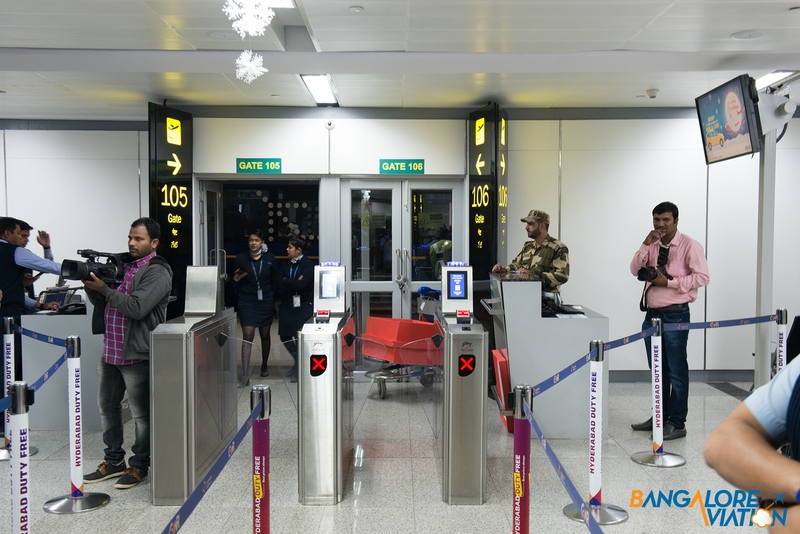 Just after I reached there was a lamp lighting ceremony and a special line was opened for check in of the ATR flight. 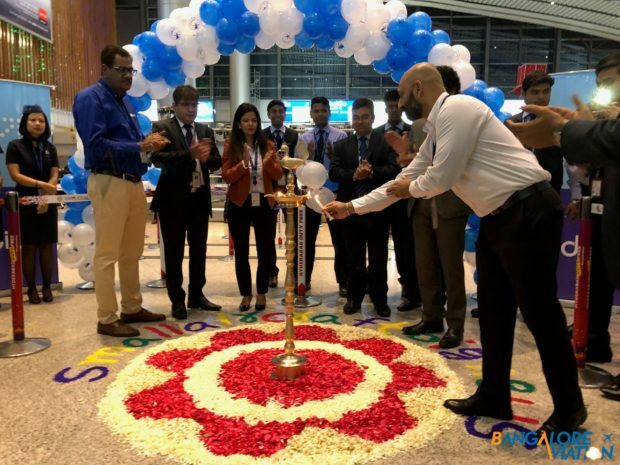 Lamp lighting before Indigo’s ATR inaugural flight. When I reached the check in desk, I was welcomed by the supervisor and the counter agent quickly handed me a boarding pass. After receiving the boarding pass, I was presented a certificate for flying on the first flight and a small goodie bag. I then proceeded through security which was reasonably long. And then down to the gate. When I reached the gate, boarding had not yet begun. When boarding began, it was called sequentially with rows one to ten being called for boarding. Passengers in these rows were sent to the aircraft in the first bus with the rest of the passengers following in a second bus. When the second boarding group was called, I went through the gate and was handed a little box with a piece of cake. 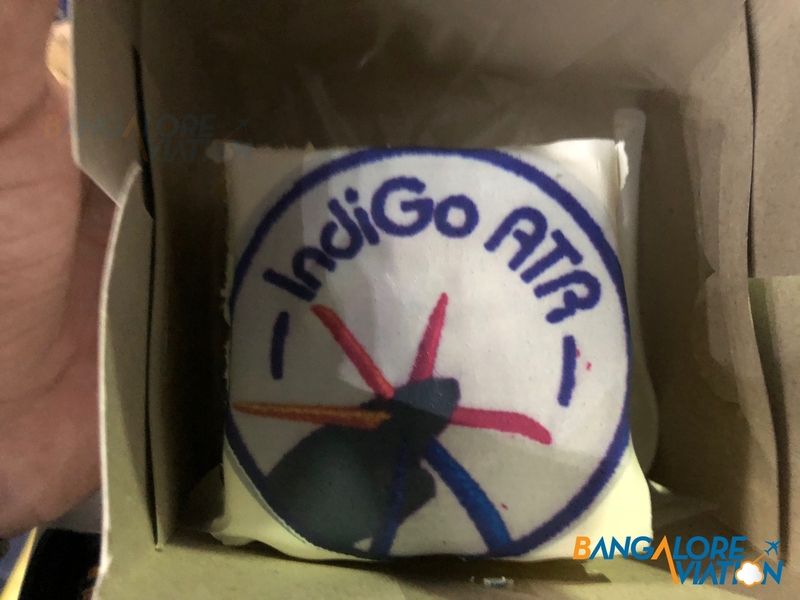 A piece of Indigo’s ATR inaugural cake. At the aircraft there was a bit of organized chaos as people were walking around the aircraft taking pictures and a whole lot of people from Indigo and ATR had come to see off the aircraft. Since I was taking pictures, I was one of the last to board the aircraft. Indigo has developed one of their signature boarding ramps for the ATR as well, so you do not have to climb up the door steps. I was the last to board the aircraft and there was still a bit of a line since the plane had run out of bin space. 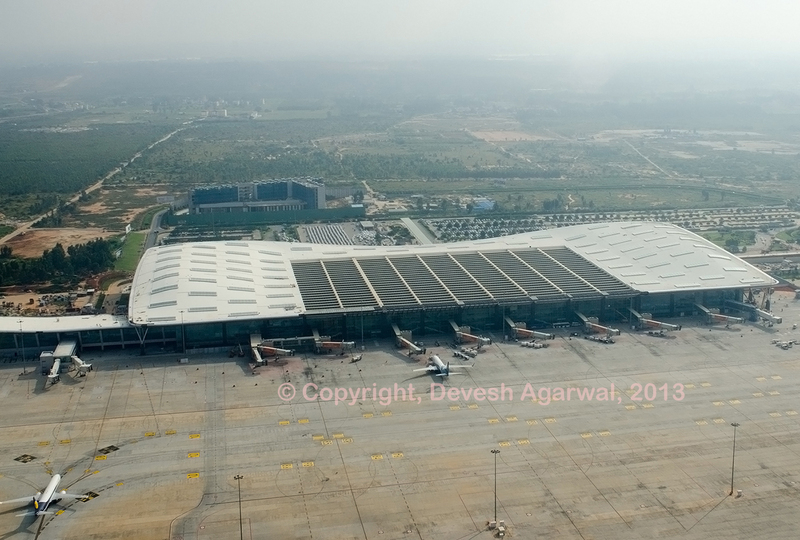 Rajiv Gandhi Hyderabad (HYD) to Mangalore Airport (IXE). 6E 7101. Depart 07:05 Arrive 09.10. All times local. ATR 72-600. VT-IYA. Seat . 21-Dec-17. When I got into the aircraft, a ground crew asked me if he could check my bag since the bins were full. However the first thing I noticed was that the bins were not full – just badly managed. With a quick rearrange of the bin above my seat, my international size carry on fit right in without a problem. 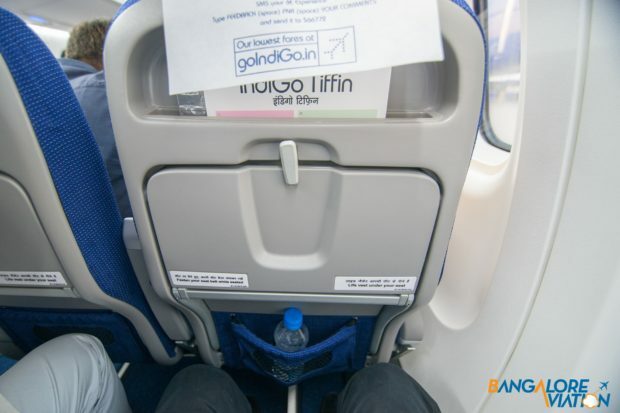 While experience of managing the bins will build automatically with the crew as the airline continues to operate the aircraft, Indigo should look into training the crew how to best utilize bin space on this smaller aircraft. Indigo’s ATR has a standard 2-2 seating like most other ATR’s. The one difference is that the first row of seats face backward. 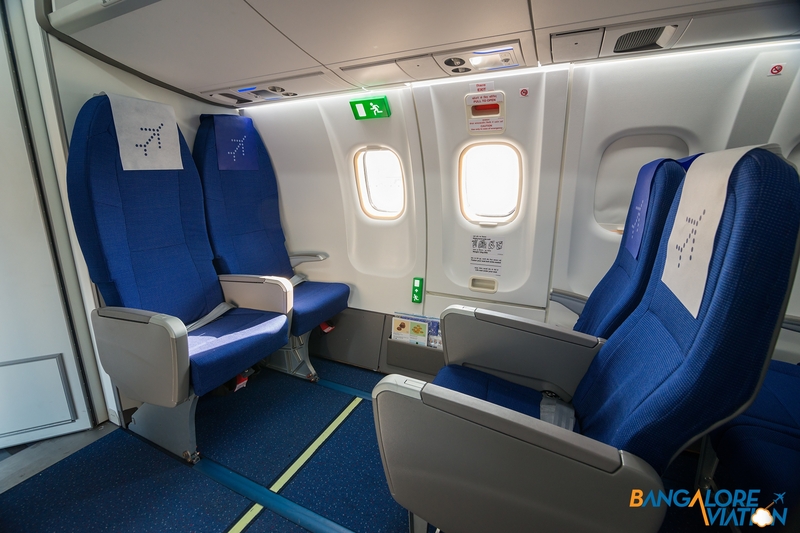 The seat is reasonably comfortable and has adequate leg room – the profile of the seat especially leaves space for your knees which I used to always bump into the seat in front of me on other ATR’s. Each seat has individual AC vents which are pretty powerful. Compared to other airlines ATR’s Indigo’s ATR has more leg room and the seats are more comfortable. 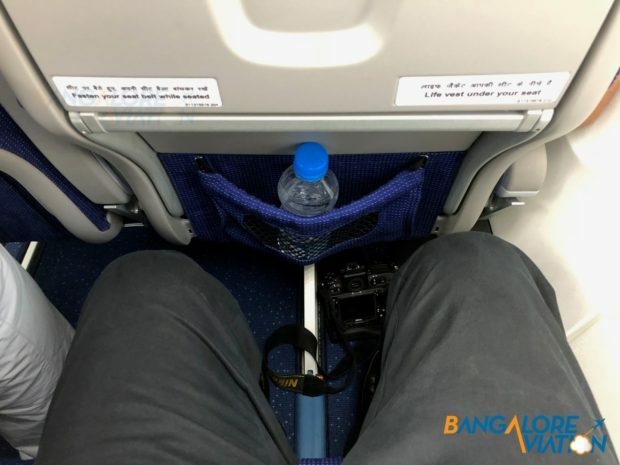 However Indigo’s A320’s I felt have slightly more leg room and wider seats. 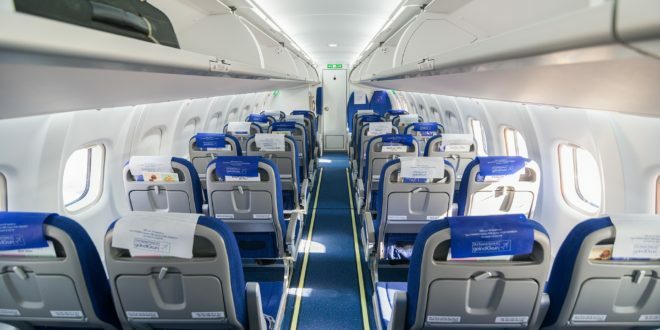 The cabin has a very modern look and feel compared to the older ATR’s I’ve flown on before. 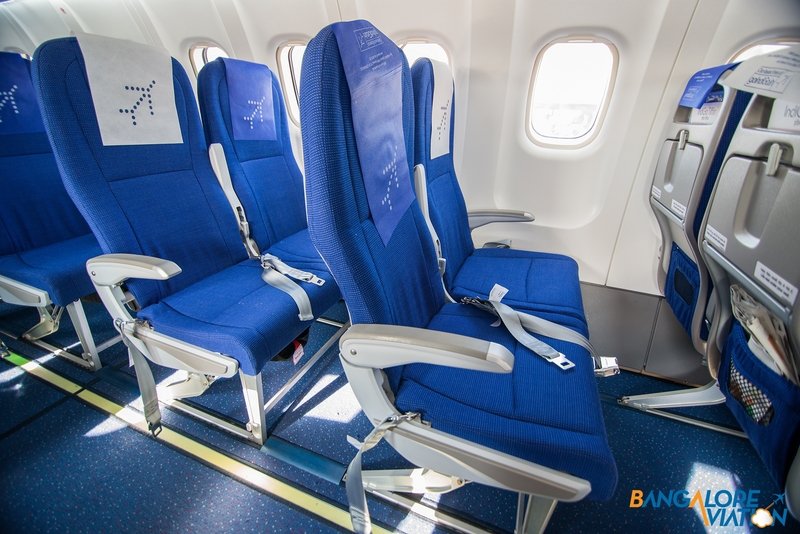 Seats on Indigo’s ATR 72-600. 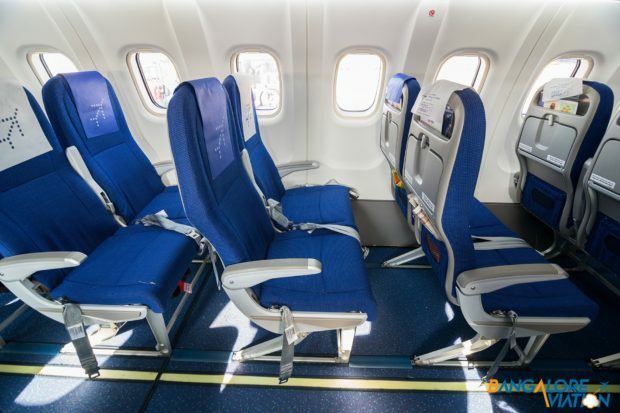 The first two rows of seats on Indigo’s ATR 72-600. The cabin of Indigo’s ATR 72-600. After boarding completed, the aircraft pushed back from the gate, 10 minutes before it’s scheduled departure. We waited for a little while in the departure queue and were in the air at 0720. A short while after departure, the crew the meal service. As with all it’s services Indigo as a buy on board meal service. The menu on the ATR is expectedly not as expansive as the menu available on the airline’s A320’s. 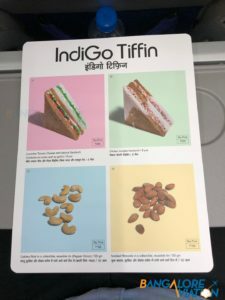 Food menu on Indigo’s ATR. 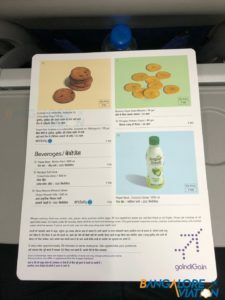 Drink menu on Indigo’s ATR. The crew conducted the service just as efficiently as they do on their A320’s and were warm and helpful. 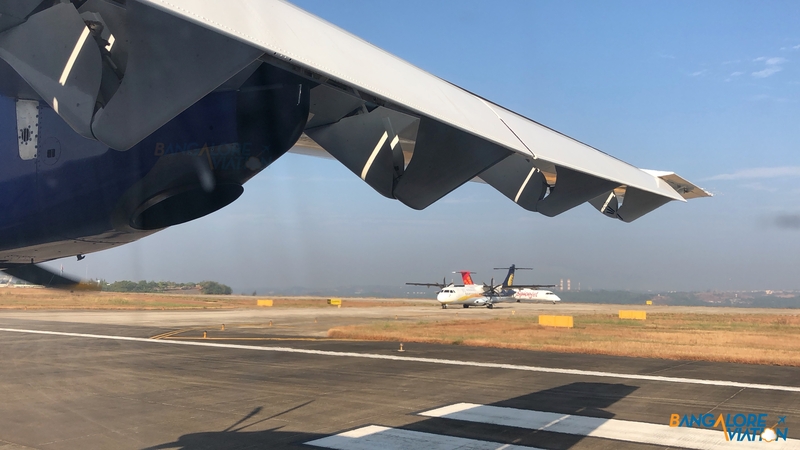 The rest of the flight proceeded uneventfully and we landed at Mangalore airport about 7 minutes before our scheduled time of arrival. As we landed, two competitors in the regional market looked on. As the plane exited the runway, it was welcomed with the traditional ARFF water canon salute to commemorate the new service. The aircraft deboarded as usual. 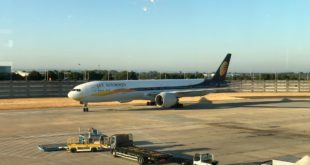 As passengers were emptying out of the front of the plane, ground staff were already following them vacuuming and getting the aircraft ready for it’s next flight. Indigo’s first flight lives up to what it promised – a regional expansion of the airline’s efficient service. 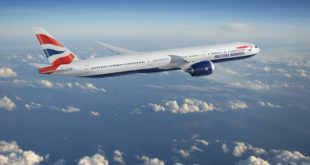 While there isn’t too much more to write about the trip itself – only time will tell how the aircraft type benefits both the airline and it’s passengers. 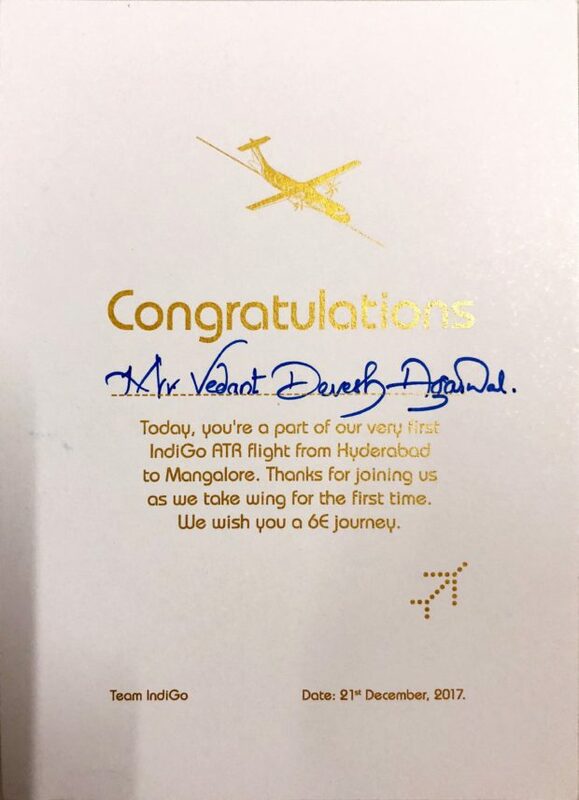 Disclosure: BangaloreAviation was invited by Indigo on this flight, they provided the air tickets for the journey. 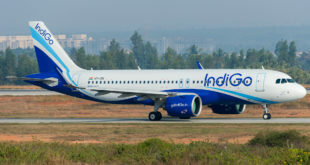 Indigo or its affiliates did not review, or revise this article prior to publication. Our views remain independent and our own. All pictures are copyright of Vedant Agarwal and are used with permission, all rights reserved. Please do not reproduce in any form.